SNAFU! : Forget whether or not the F-35 has seen combat...the real story is the Pantsir! 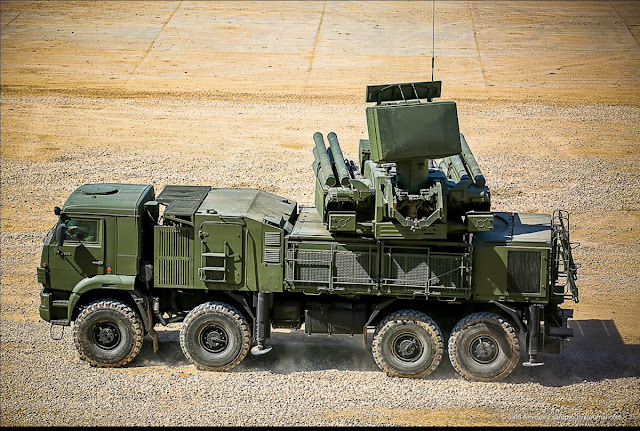 Forget whether or not the F-35 has seen combat...the real story is the Pantsir! Thanks to Empser for the link! Georges Malbrunot, who writes for French newspaper Le Figaro, cited French intelligence sources. He posted on Twitter today that examples of the Israeli F-35 – two of which have been delivered to the country to date – took part in a raid over Syrian territory on the night of January 12-13. The mission saw them strike objectives around the capital, Damascus. According to Malbrunot, the F-35s targeted warehouses containing Russian-made Pantsir-S1 mobile surface-to-air missile (SAM) systems that Israel feared could be delivered from Syria to Hezbollah forces operating in Lebanon. The warehouse was located at Mezzeh, a military airfield in Damascus. During the same attack, the Israeli Air Force (IAF) also reportedly destroyed an S-300 SAM battery deployed near the Syrian presidential palace, on Mount Qassioun. According to the same unnamed French intelligence source quoted by Malbrunot, the F-35 aircraft finally overflew the palace of Syria’s President Bashar al-Assad, before returning to Israel. Providing the account is true, it seems unlikely that Israel would admit the use of F-35s at this stage. However, in the past the IAF has been quick to put new assets into combat if required for specific missions – and the continued effort to prevent advanced weapons landing in Hezbollah hands may fit that remit. Forget the talk about the F-35. The US software is a mess and if the Israeli's have worked out their own code that works like a champ it still doesn't matter (unless they sell it to Lockheed Martin) because the US won't allow them to sell it to other F-35 users. That's a crazy powerful statement. If we are to believe the F-35 part of the story (and I don't) then what should have everyone going nuts is the last part! A French official is stating that a Russian anti-air system can in essence nullify the mighty Israeli Air Force...in essence provide a terror group with an anti-access/area denial ability? Is the Pantsir that good? I don't know but I need to find out!